These pictures are from the Saturday at New York Comic Con. I apparently took a lot more pictures on this day than the day before! There were just a ton of great costumes to be seen - maybe not quite reaching SDCC levels, but it was close. NYCC impressed me this year. Let's take a peek. For a cartoon about a man with a horse head, Bojack Horseman is one of the darkest shows I've seen in a while. It's really deep and at times incredibly depressing. And there are jokes, too! Princess Caroline here did a great job with her costume. Here's a lonely picture of Gambit. I hear that this version of Angela won the top costuming award in at least one category later this night. It's easy to see why - this person did a fantastic job. Really well done. If you ventured outside the convention hall, chances are that you saw what appears to be a TSA repository for the magically inclined. No one was really safeguarding any of these, either. Anyone want a Captain America shield? I assume that these were taken from people who tried to enter the show because they might have posed some kind of hazard...though I saw plenty of people inside with swords and other big, potentially dangerous items. Who can say? I loved this silver age Brainiac and Lex Luthor combo! RIIIICHAAARDS!!! The Fantastic Four costume fragment was a nice touch. The Lich with some light reading material. Jean is kind of blocking Scott here, but that's okay. These costumes are mostly comic accurate, except for Wolverine, who just shows up uninvited all the time anyway. Here's some more X-Men. Jubilee's finger sparklers are a good solution! This Jurassic World display was the bane of my existence. They brought out animatronic raptors every hour and people swarmed the display. They had fog at times, too, which made it even more annoying. I guess you gotta use the space that's available, but man! 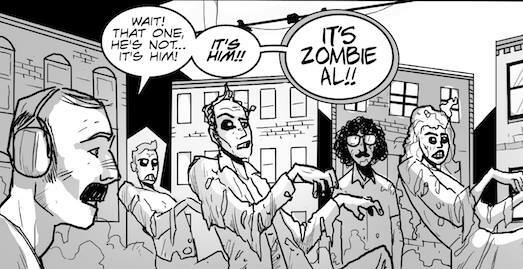 Check out zombie Cap's teeth. Nicely done! The entrance to the show was re-done with the Jurassic World branding, too. Not as annoying. Oh, did you know that there was a guy who dressed up like THE THING at the show? He wasn't the only guy, either. What a terrific costume. I bet it was hot as all get-out in there. But this guy suffers for his craft, and for that we're all grateful. Oh yeah!! Of course, I had to get a picture with Mr. Grimm here. It looks like he took some battle damage. That's okay...I'm sure he came out a winner. Supergirl and alternate universe Supergirl. This costume had wings that retracted and expanded. Gorilla Grodd! Complete with gilded human skulls. 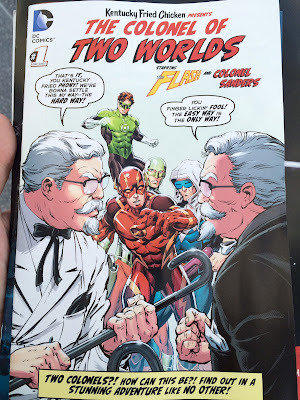 ...which I understand is completely ridiculous, but I had to get this stupid promo comic from Kentucky Fried Chicken, especially after picking up KFC's offering at SDCC. This one had nothing to do with the earlier one, which was a shame. Also, Flash's new outfit is terrible. 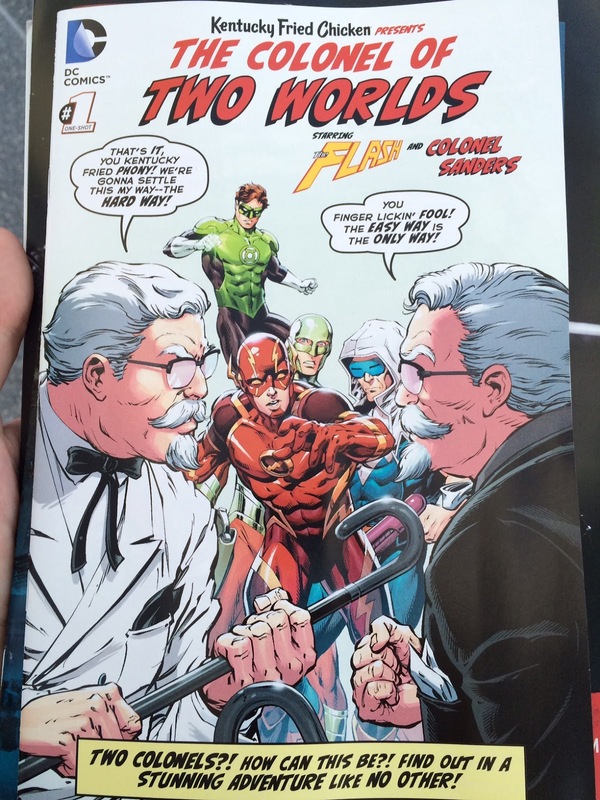 The story inside has an evil Colonel Sanders from - no kidding - the Crime Syndicate's Earth 3. I'm still happy that I was able to find this book. One of my last stops during the show for the day was at a Valiant Comics panel. Everyone's good friend Rafer Roberts is writing the upcoming Archer and Armstrong relaunch for the company, and this was one of the first big brouhahas surrounding that. After the panel, Rafer had a signing at the Valiant booth (with Jody Houser)! Really happy for the guy. Artist alley stays open for an hour after the show floor, so I spent the last hour there. It seemed that it cleared out pretty quickly, though, for whatever reason. Once again I ran into Karin Rindevall and managed to cajole her into drawing in the Thing sketchbook! We squatted at the table of an A-list artist who left early (a legend, really) and Karin left her mark on the book. I've scanned 'em all in and will show them off soon...maybe the next post? ...but then I decided to walk six miles at night though the streets of New York City to find some Mug Cream Soda. But find it I did, and boy, was it good. NYCC stepped up its game in 2015. And with the upcoming expansion of the Javits Center, I hope that it will only get better. I'm looking forward to the 2016 version already! I've had some luck with some cool Thing items recently. Here's a statue I've been looking to pick up for quite some time. This is the Art Asylum Marvel Milestones Thing statue from Diamond Select (phew!) and it came out about a decade ago. I had a chance to buy one at the time but couldn't afford it. Often times, statues and other items such as this will depreciate in value over time (due to a lack of interest or simply a greater supply), but this statue has bucked the trend over the years and has been hard to find. The statue is a recreation of the Jack Kirby classic Fantastic Four #51 cover from 1966. It's referred to as the greatest Thing story of all time and comes right after the Galactus trilogy...Lee and Kirby were at their best around this time. The story features a jealous scientist rival of Reed Richards who steals the Thing's powers in an attempt to infiltrate the Fantastic Four and kill Reed. The Thing on the cover is *probably* the imposter Thing (covers don't always directly represent the story inside), meaning that this statue might actually not be of Ben Grimm at all, but the jerk who stole his powers. The statue itself is a little under 12 inches tall and is pretty heavy. 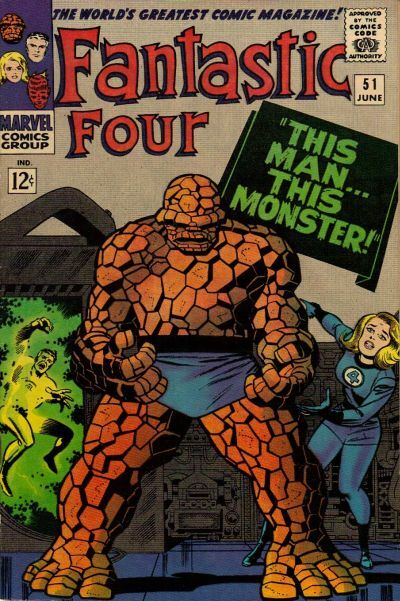 The Thing's head is a little disproportionately small compared to his oversized hands and feet, which is a little strange considering that the Thing on the FF 51 cover is fairly undersized compared to how he is sometimes depicted. I unfortunately didn't get a box with this statue, but it was an instance of beggars and choosers this time around. I got the item for a incredible price and the statue itself is in perfect condition. To give you some idea of how much this statue can sometimes run, here's a link to a current eBay auction (with the box) that has a buy it now price of $1200, which is kind of outrageous. Who knows what leads someone to set a price that high. Maybe the person who owns it doesn't really want to sell it, but why list it at all if that's the case? I can't imagine that the statue will sell at that price (I paid less than 10% of that for my version), but until I found this guy pictured above, I had only seen versions priced in similar ranges. If I've got to pay over a grand just to get the box, I'll be happy to keep mine as is. The bottom tells me that there was a run of 2500, which is actually not too bad for a Marvel statue (another I'm looking for only had a run of 125), so, again, I'm not sure why these cost so much on the secondary market. They don't seem especially fragile, so I can't imagine that there are a lot of broken versions out there. Whatever the reason, I'm happy to finally check this great Thing statue off my list. It's a neat item that is fun to look at...which I guess is the purpose of statues. Well, I might as well unload the next slideshow on the blog that is apparently all about showing lots of pictures. Now that we're done with the pictures from Comic-Con in San Diego, I guess we'll fly across the country to New York for their annual response! I was able to attend for the Friday and Saturday of the event. While NYCC doesn't stack up to SDCC, New York's show is finally starting to take shape and show off its own identity. I found that I enjoyed 2015 more than any previous year. It was recently announced that the Javits Center would be seeing a substantial increase in size - 1.2 million additional square feet, including a half million feet of new exhibit space - in the next few years. The convention center will soon have a new ballroom that will rival San Diego's Hall H. Despite the incredible number of people who attend NYCC, the big thing that was holding it back was available space, so it'll be interesting to see if this new addition will help the convention truly rival SDCC, at least in on-site events. There were an abundance of costumes on display at the show, but not a lot of places to take pictures of said costumes. Many people stopped in the lobby of artist alley. Here's a nice Zatanna. I have no idea what the Superman dummy is doing on the floor. I'm not sure if I want to know. Jelly Belly had a display set up in the tunnel to artist alley, and all throughout the weekend there was someone building a mural with jelly beans. They gave out samples, too, and I snagged...a lot. It's the guy with toy dogs strapped to his face! I saw this guy at Comic-Con over the summer. I still don't get what's happening here, but I guess he's got his own camera crew. He interviewed folks at the FUBAR table for a while. Among the pieces of original art I saw at the show, here's a Jack Kirby original from Fantastic Four #40 (an important issue)! This page was apparently set to go to auction, and probably brought in more money than I make in a year. I met Sweden's own Karin Rindevall for the very first time at NYCC! Karin has colored a number of pages for me over the years, and was one of the first collaborators I ever worked with. It was so great to finally meet her! As the show wound down for the day, I made sure to get to the Rotten Tomatoes panel. My love for RT is no secret on this blog. They do a great job and everyone should check out their panels at either SDCC or NYCC. Apparently, people are starting to take my advice. The room was a little small for the panel, but it was absolutely packed. It's great to see these guys every year. There were a number of new panelists involved this time, too. Here's emcee Grae Drake. Do a google search for her and you'll see her at every major movie award show with some of the biggest actors on the planet. Why does she acknowledge my existence? I have no idea. And here's Matt Atchity, who runs the whole dang show. He is way too important to be taking pictures with me. And yet, here we are. Bizarre. Image Comics hosted a party at a nearby location after the show. It's great that NYCC is starting to branch out, even unofficially, into the city. The place, much like the show, was packed. I went to the show with my brother-in-law. We bowled a few games at one of the many lanes. We eventually played a few games with writer Jim Zub (Skullkickers, Samurai Jack) before calling it a night. On the way out, I ran into none other than Paul Tucker! Paul's another friend and collaborator that I had never met in person before. We were able to hang out a bit on Saturday and I'm sure I'm not surprising anyone when I say that Paul is one of the nicest guys you're likely to meet, in comics or otherwise. Paul has drawn a number of things for me over the years, and now he's got a great book out from IDW, "Tet". I highly recommend it. This concludes the first half of my NYCC pictures. There will be more. I can feel the anticipation building. Read the story for free here! I've been involved with FUBAR for about five years now, and there are a lot of stories that I'm proud of and enjoyed working on. A while ago, I wrote a story featuring Elvis Presley and the many conspiracies surrounding his death. It ran much longer than I had planned, so it was eventually decided that it could support its own single-issue book, which soon grew to a full 32-page issue to be filled out with a few backups. These backups would all focus on musical artists. I almost made the biggest mistake of my life (possibly) by not putting two and two together and writing one of the stories about "Weird Al" Yankovic. But soon enough I came to the obvious conclusion and the eight-page short "Eat It" was born. The entire issue, titled "All the King's Corpses" and featuring an Elvis cover by Danny Cruz and Paul Little, while be solicited in Previews soon. 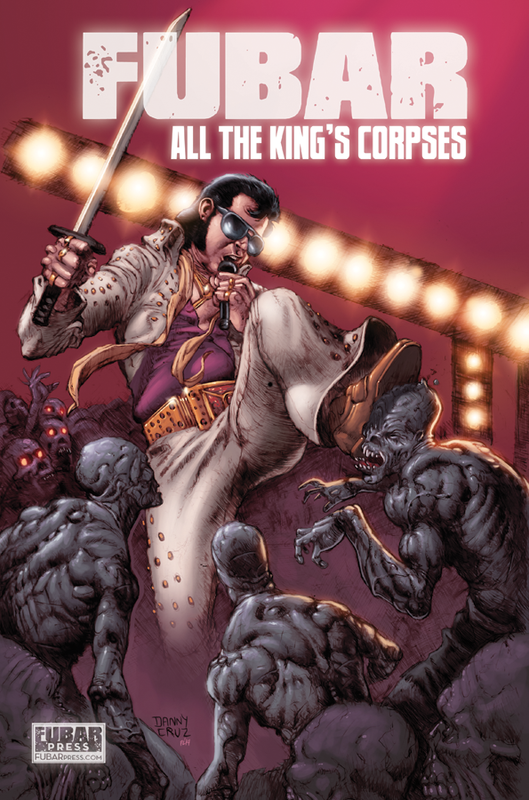 In addition to the Elvis and Weird Al stories by me, there's a Jim Morrison story by Michael McDermott and Will Perkins, a Waylon Jennings tale by your friend (and mine) Larry Franks and Kelly Williams, and a new Combat Quiz by Jennie Wood and Williams. 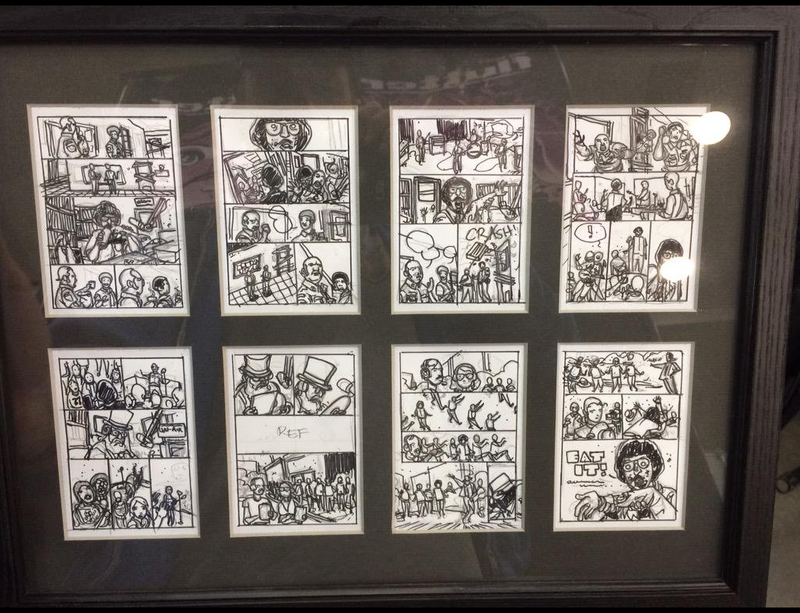 When I was at the Baltimore Comic-Con a few months ago, Jeff McComsey surprised me with the eight pencil roughs, all framed up and looking great. I was really taken back. This is hanging up right behind my computer, actually, so I'm looking right at it as I type this. 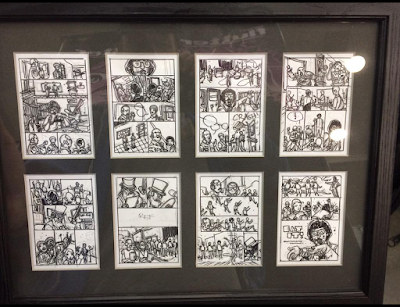 Not only that, but soon after, Jim McMunn was kind enough to send me the original page art for the story. Here are a few images of that. Jim finished all of the artwork digitally, so the physical pages are in different states of completion. They look just fantastic and I'm absolutely thrilled to have them in my possession. This was a passion project that will hopefully have some appeal for others as well. 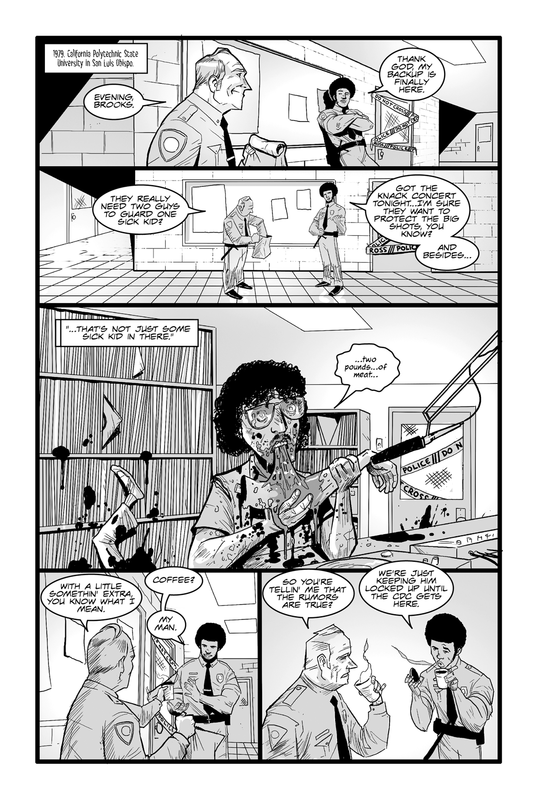 I'm so glad that I finally got to write a Weird Al story. I'm even more grateful that some friends helped out and that it turned out as good as it did. I hope you all enjoy it as well! Addendum: Sometimes I think, "what can I title this post that might make it show up earlier in search results?" Or, "if someone sees an image from this post on a Google search, how can I try to make sure he or she knows that I had something to do with this?" (this usually occurs when I am shouting into the void). And then, a title like the one at the top of this post is born. Carry on.